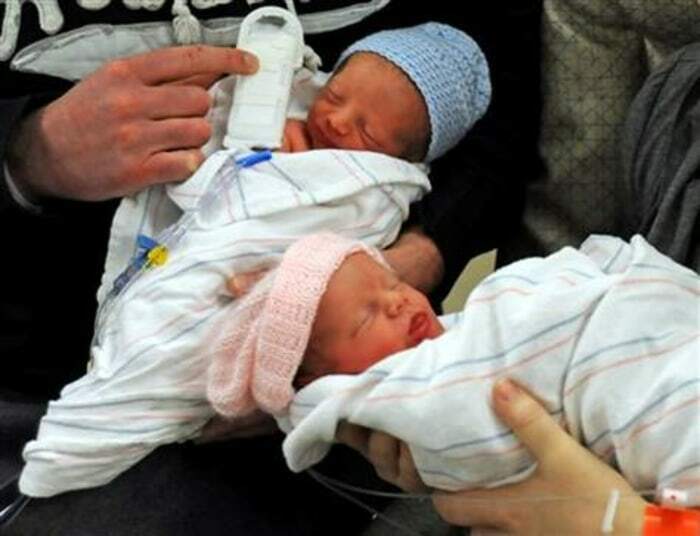 Parents hold their twin newborn babies at the Hennepin County Medical Center in Minneapolis, Minn. on Jan. 1, 2012. Most moms can safely give birth without Caesarean section surgery, according to a study published recently. Expecting twins? You probably don't need to schedule a Caesarean section. Most moms can safely give birth without surgery, a big study finds. It's the latest research to question the need for C-sections, which are done in one-third of all births in the United States and three-fourths of those involving twins. Studies increasingly are challenging long-held beliefs about Caesareans, such as that women who had one need to deliver future babies the same way. "These results do not indicate that all sets of twins should be delivered vaginally," but that planning to do so is a reasonable choice if the doctor is experienced in twin births and knows when a C-section becomes necessary, Dr. Michael Greene of Massachusetts General Hospital wrote in a commentary in the journal.